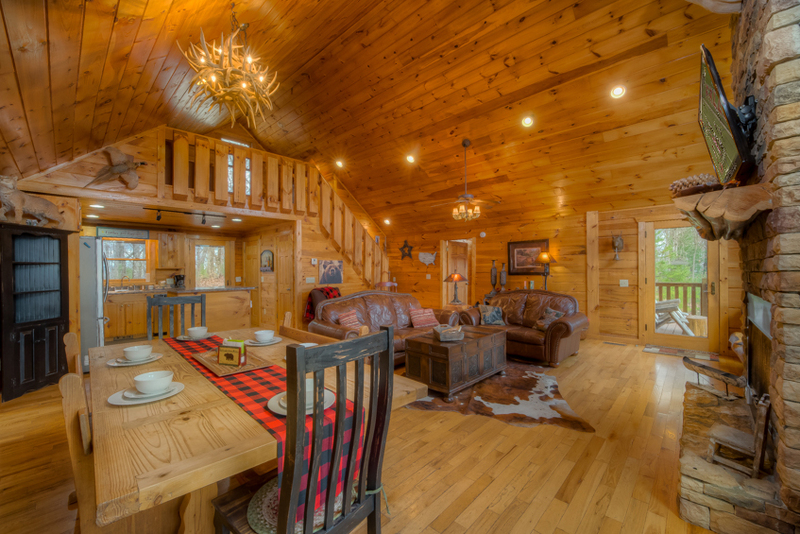 Welcome to this spectacular North Georgia cabin - you have truly found ‘A Heaven On Earth’... 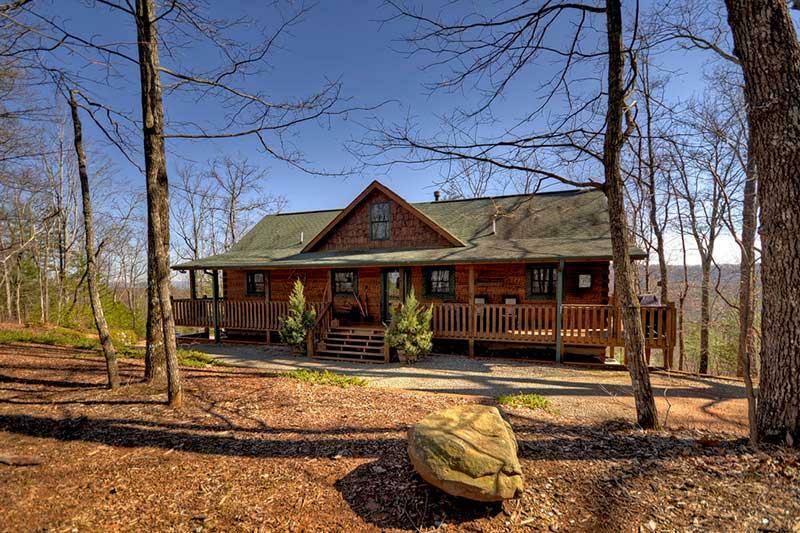 Here, even your travel will be about the perfect mountain getaway that starts with a scenic drive, up winding gravel roads that culminate to this well-secluded, large-scale home offering the ultimate in luxuries. 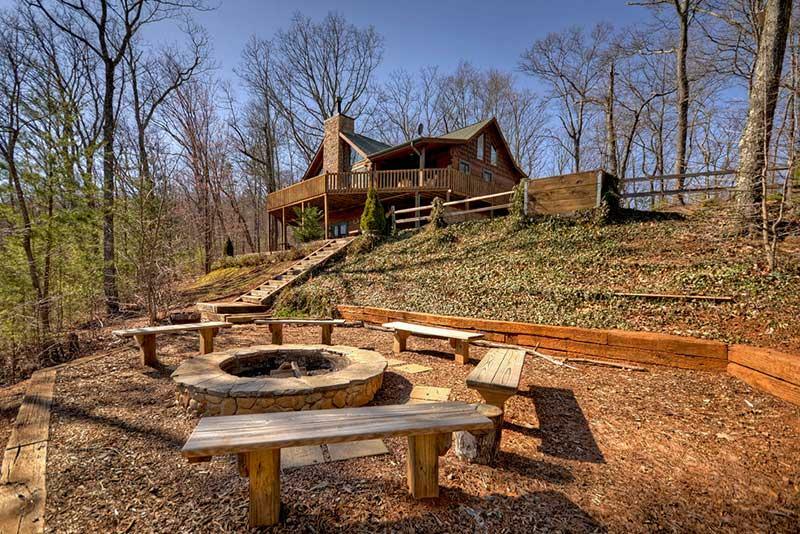 A Heaven on Earth is indeed in a heavenly spot atop a scenic ridge with two private, wooded acres to roam. 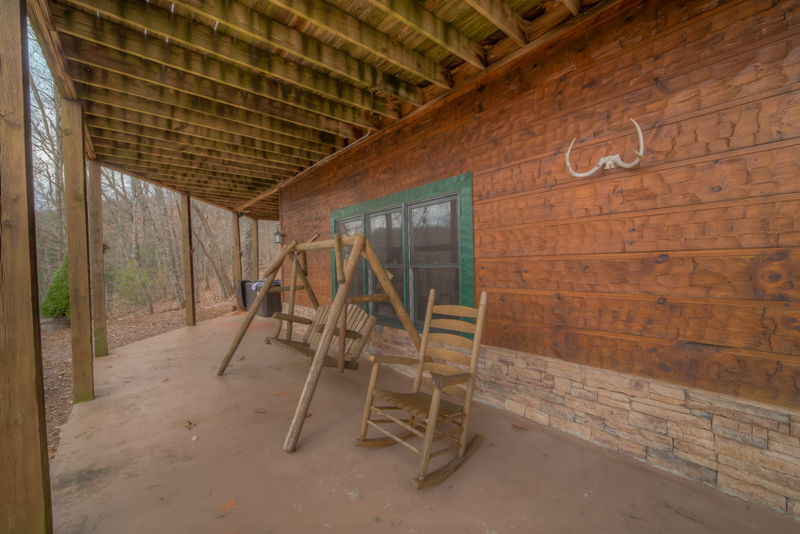 The property has well-tended paths leading to all of its outdoor amenities. There are abundant bushes from which you can pick fresh blackberries for a natural snack to kick off your journey to the area’s hiking trails. 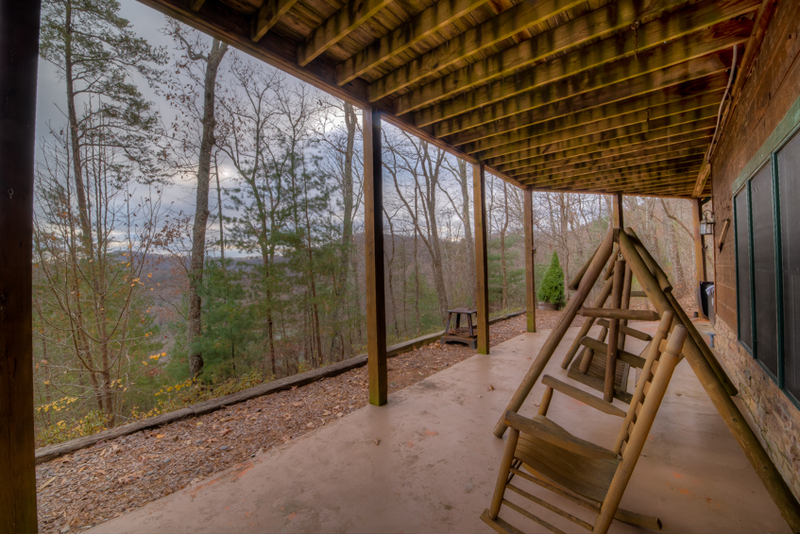 In fact, grab the cabin picnic basket (provided) for a relaxed hike because only 20 feet from the front door are trails through the Cohutta wilderness. Or, grab the custom, hand-carved hiking sticks (also provided) for a more rigorous hiking experience. A Heaven on Earth offers exceptionally high elevations (3000ft) with stunning long-range mountain views with clouds billowing at their base. 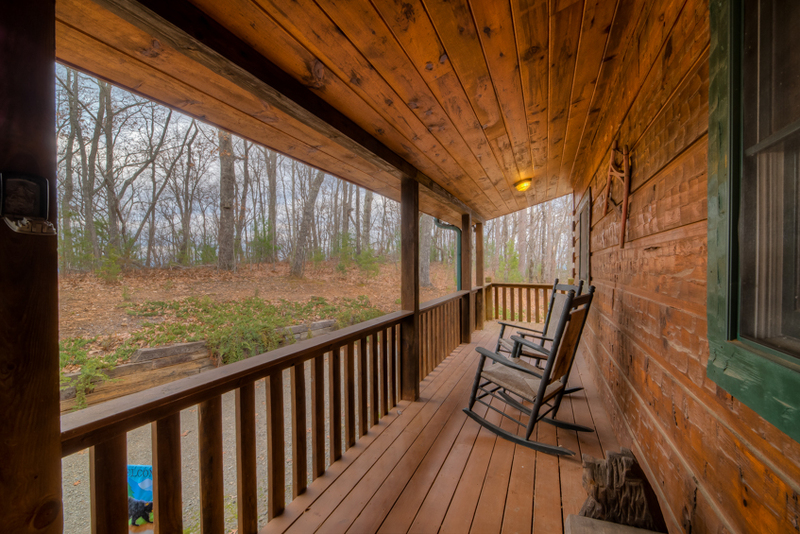 Enjoy the views from the picnic table while dining mountainside, or from the rocking chairs dotted along the home’s enormous wraparound deck where everyone can gather and tell fishing stories. 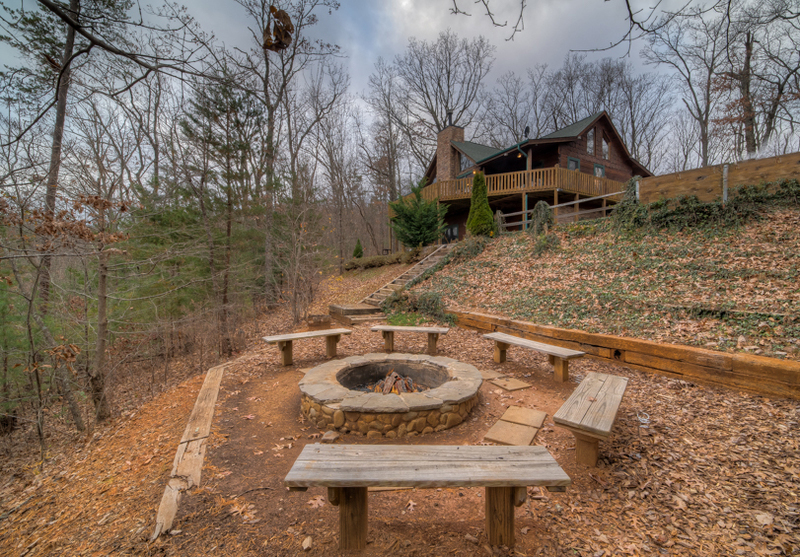 The outdoor activities abound with a gorgeous fire pit for an evening filled with s’mores and sing-alongs. 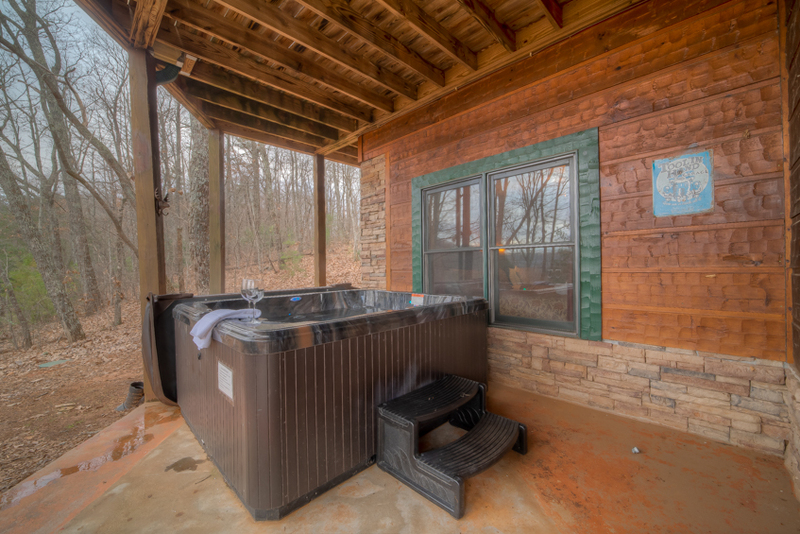 A huge, top-of-the-line hot tub is as good as it gets with neck massage and a waterfall. 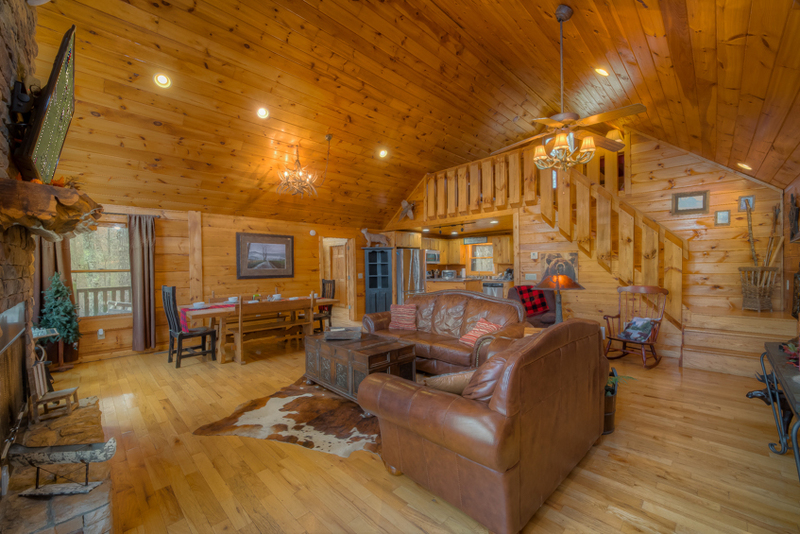 This real log home offers a unique floor plan with two master suites featuring custom crafted log beds on the main level and adjoining bathrooms. 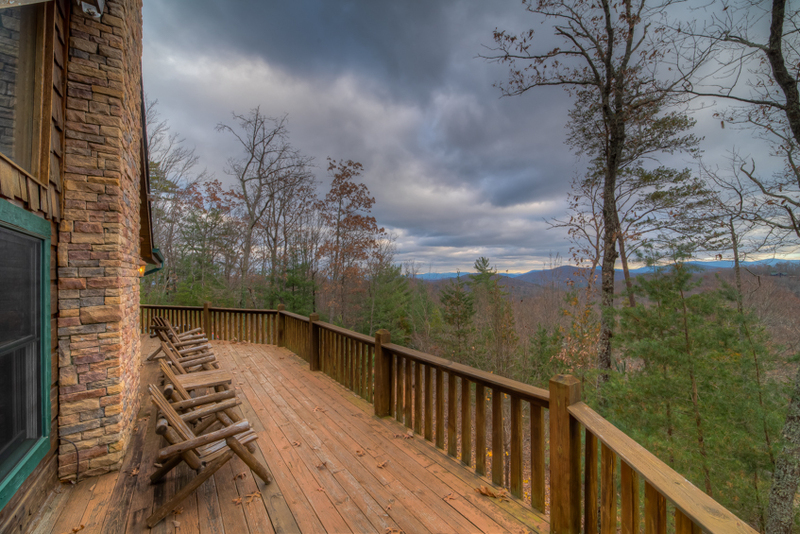 Each also features direct access to the large deck overlooking the North Georgia Mountains. 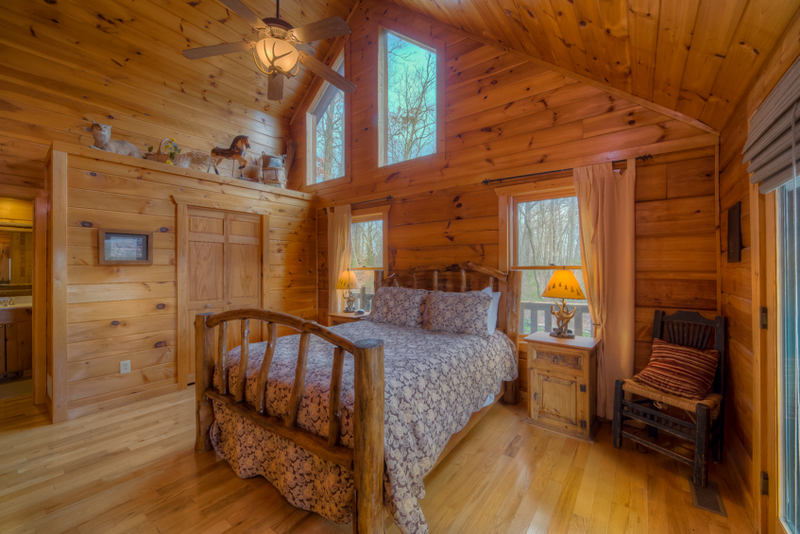 On the lower level of this three level cabin, there are two oversized guest bedrooms. 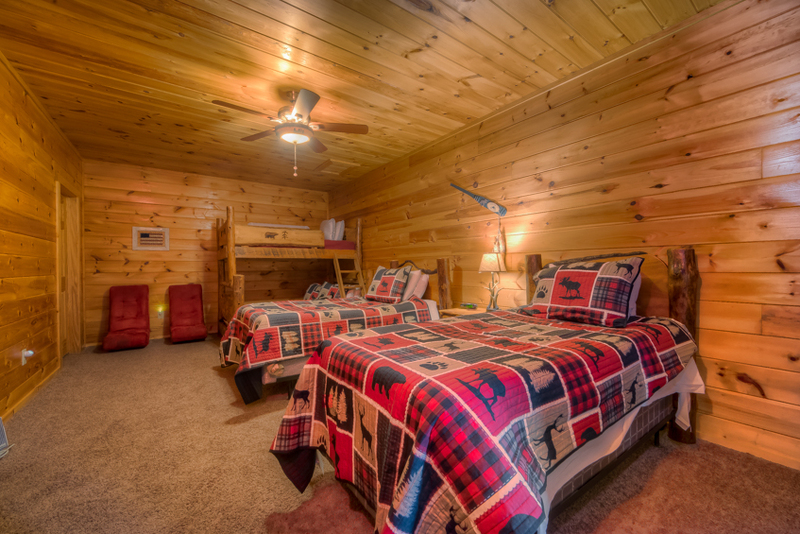 One has 2 queen size beds and a bathroom; the other has a custom log queen/single bunk bed combination, and two additional single beds make for a perfect kids’ camp. 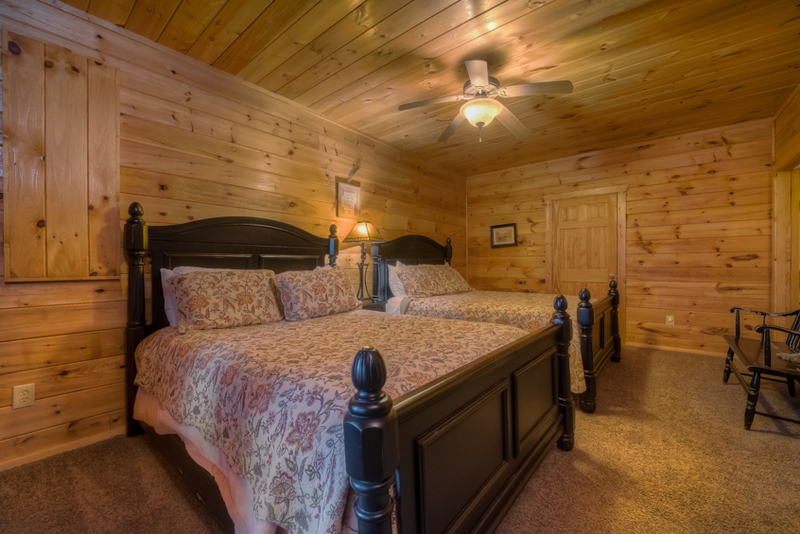 All bedrooms have pillow-top mattresses and cozy sheep skin rugs to pamper your feet as soon as you get out of bed on those crisp mountain mornings. 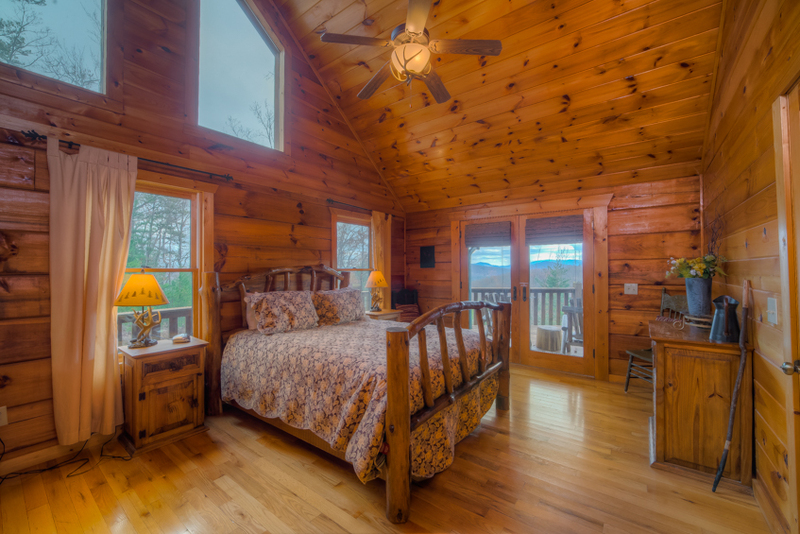 Not only are the sleeping accommodations luxurious but you will love the great room with a dramatic fireplace that reaches to the cathedral ceiling flanked on each side by plate glass windows overlooking the beautiful North Georgia Mountains. 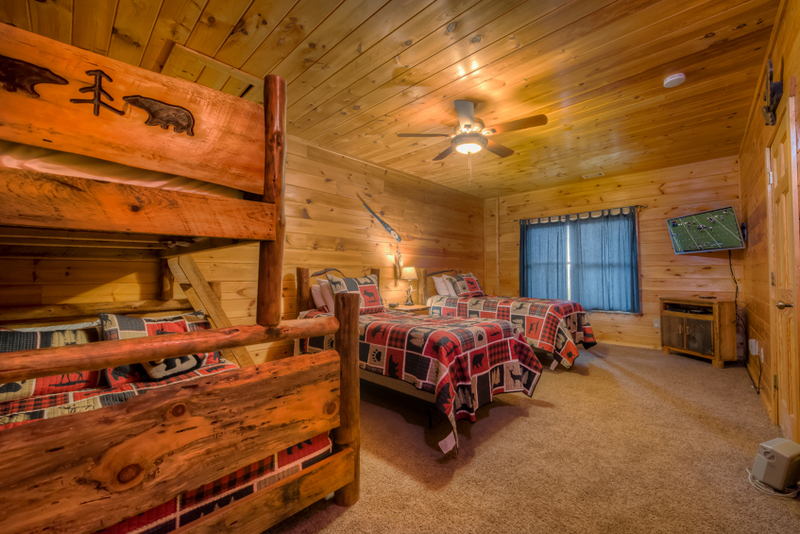 There is abundant soft-leather seating, authentic wildlife décor, large-screen television with surround sound and DVD player. 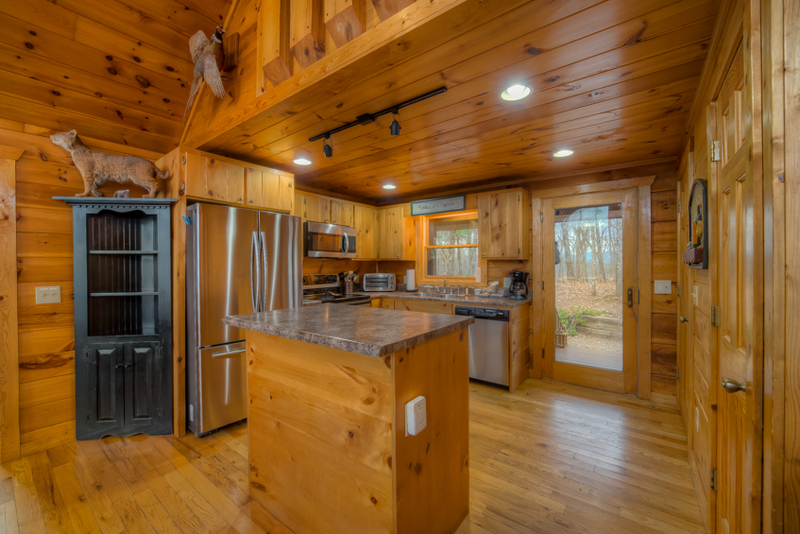 The kitchen is equipped with all stainless-steel appliances & accessories and just steps away is a dining area featuring an antler chandelier, heavy rustic wood table with bench seating that accommodates 11 guests. 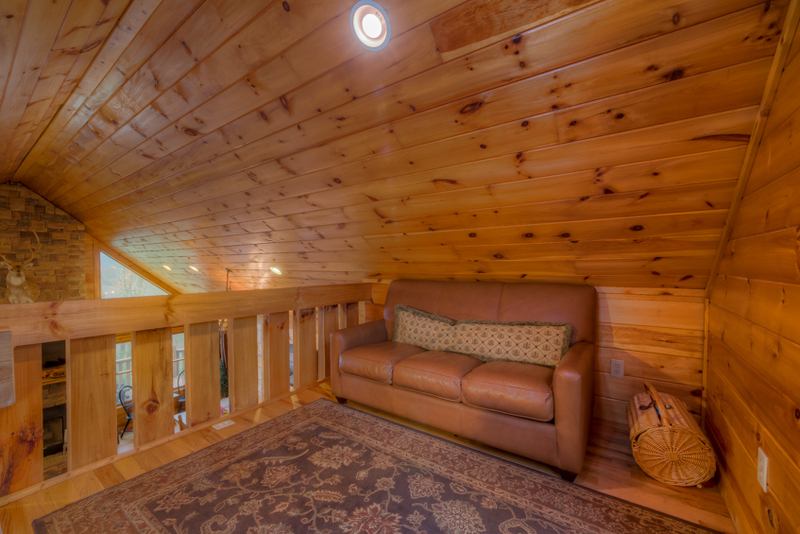 The Loft located above the living area is a peaceful place offering a leather sofa to read your favorite magazine and a desk for your journaling. 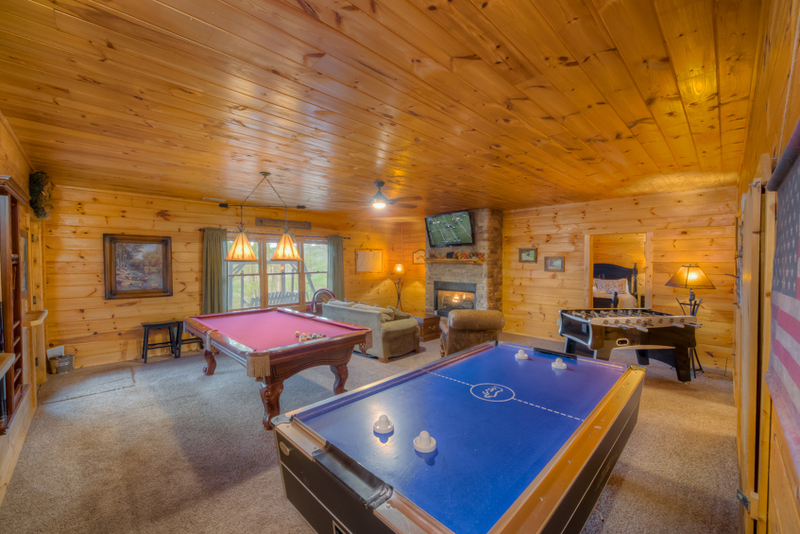 Game rooms have become ever so important in selecting the perfect cabin for your vacation. 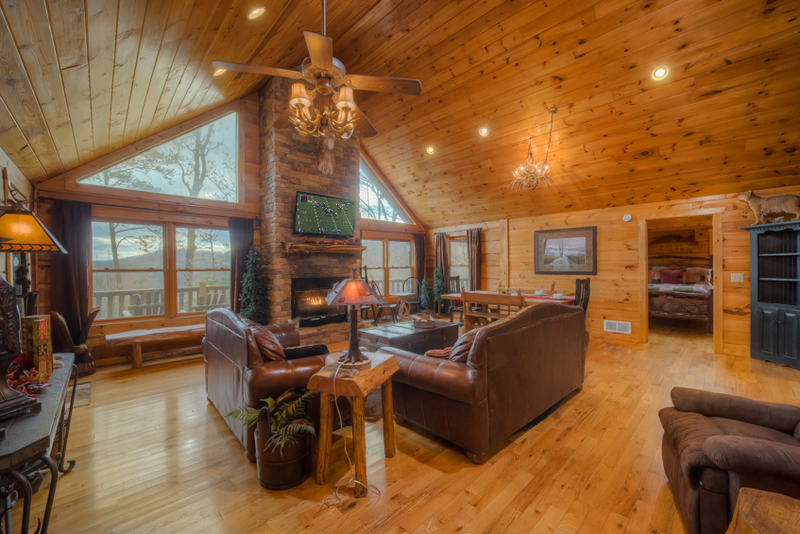 This one is no exception with dynamic offerings such as a beautiful pecan wood billiards table, foosball, and steps away from a warm and cozy lounging area in front of the stone fireplace. 02/19 - Large bedrooms, large open family room and dining space. Outdoor porch, hot tub & firepit all very nice. Great experience. Had an issue when we first arrived and a handyman came quickly and took care of it. 01/19 - The space inside the cabin was great. Great company. 11/18 - The kids enjoyed the game room. 07/18 - The home was beautiful, everything was clean and well put together. Very family and kid friendly. Had all the amenities to give u the full cabin experience!!!! Your staff was amazing, ANYTIME I called with questions, concerns, or to make a payment the phone was answered every time. They were very friendly and helpful, they were great and I’ll recommend your company anytime. 07/18 - Home was well stocked with everything needed. 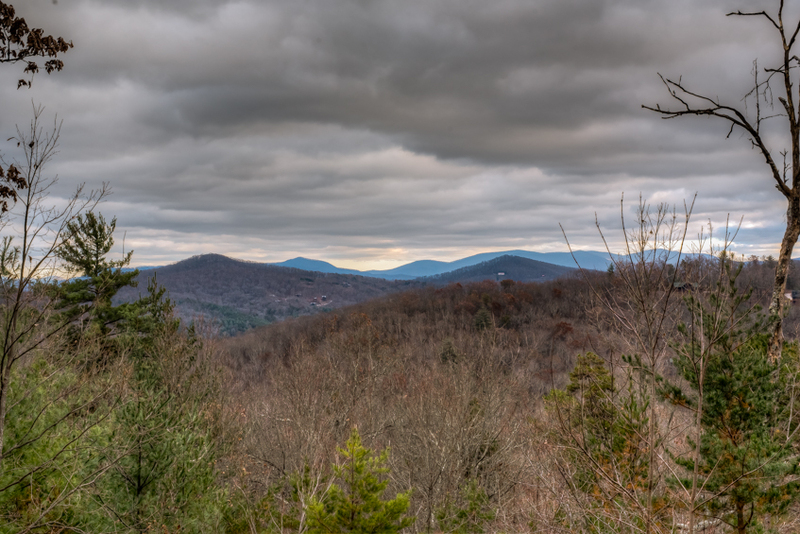 Rooms were great for two families with teenage children.Escape to Blue Ridge does a great job of making the trip easy to plan with emails and instructions. 05/18 - The view from the house was simply amazing! The house was clean and ready upon our arrival. 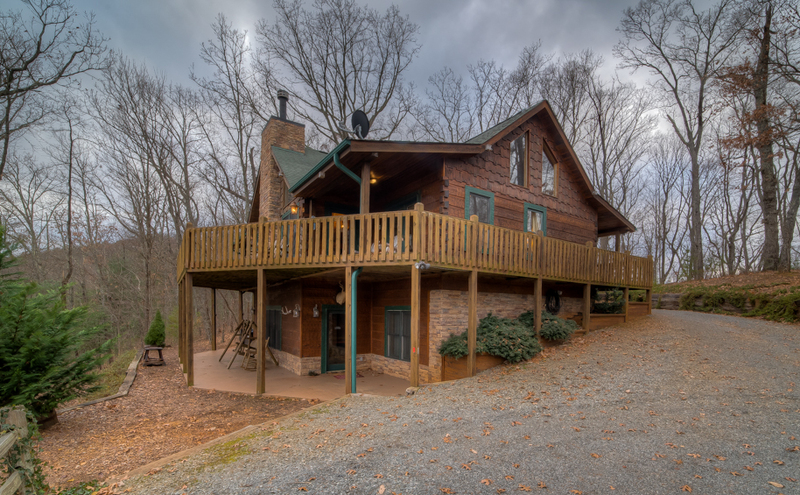 Overall impressed by the location and the house itself :) Escape to Blue Ridge is a great company and I will definitely give my business to them. Everybody I talked to was professional and I got the attention I was hoping to get. Plus the property was well kept and reasonably priced. 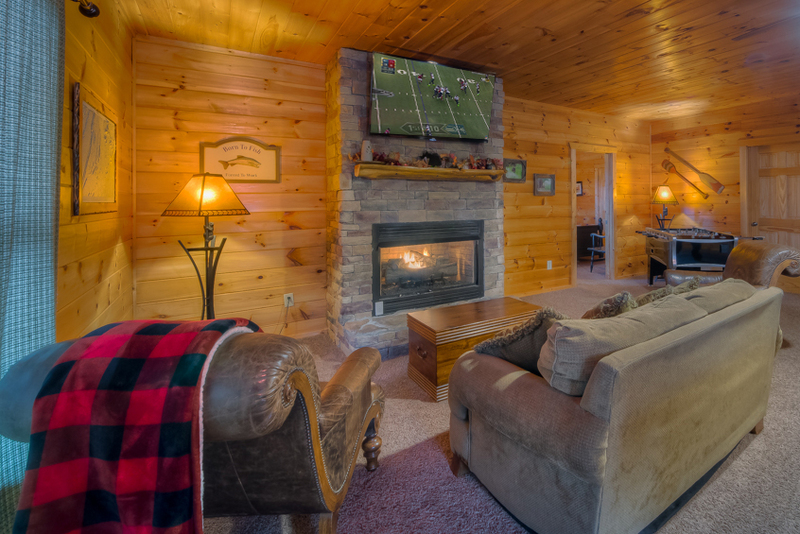 4/18 - We enjoyed the game room ... the gas fireplaces and the hiking trails. 3/18 - I enjoyed the game room in the basement. The cabin is really spacious. 2/18 - Very peaceful and relaxing. We have used you before 4 other times and we will be back. 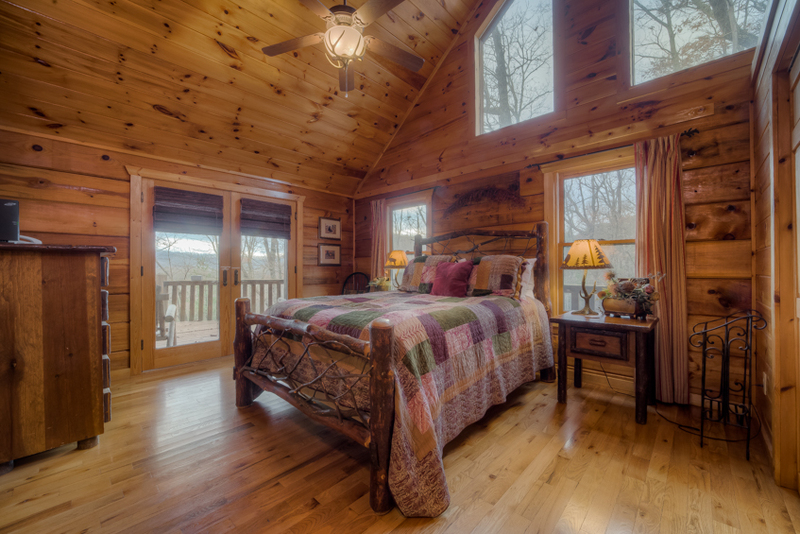 07/17- I enjoyed having a wraparound porch as well as the spaciousness of the bedrooms. It was ideal for having one floor per family as we did. I find your company very polite and professional, from reservations, to housekeeping, and those emergency "oh no the electricity is out" phone calls after hours. Great company! 03/17- It was so beautiful. Loved the 2 masters and the game room was fully stocked with the best quality tables. 2 fireplaces were perfect and the fire pit amazing as well. So nice to have 4 bathrooms. 01/17- The view is very nice and it sleeps up to 10. The company is very responsive. 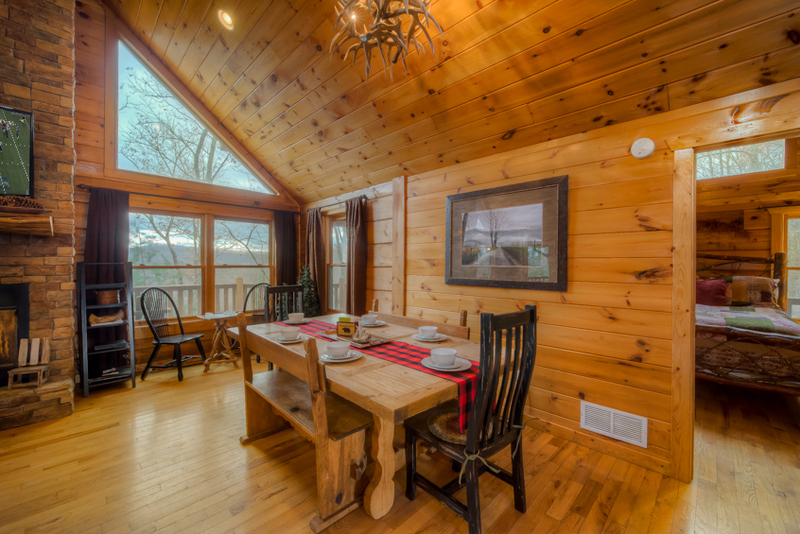 12/16- The cabin itself was so homey and spacious, and the view was breathtaking! The company was very quick to respond and kept the home neat and clean! 07/16- Well stocked across the board: kitchen needs/appliances, games, internet, TV, hot tub. Clean, everything worked. You all kept me well informed so no surprises. This is very positive as I knew what was there, what I had to bring and what to expect. Also thank you for the welcome email and responses to our questions while we were there. 06/16- The view, the game room & use of space was very well thought out. We will definitely be back to Blue Ridge! 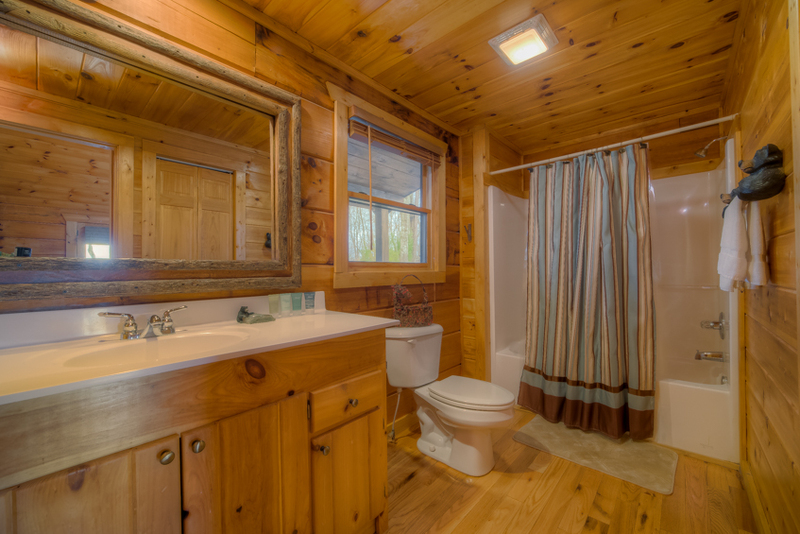 06/16- We loved the layout and amenities of the cabin as well as the seclusion you had while there. 06/16- Fire pit, game room were great. Driveway is difficult but excellent adventure all in all. 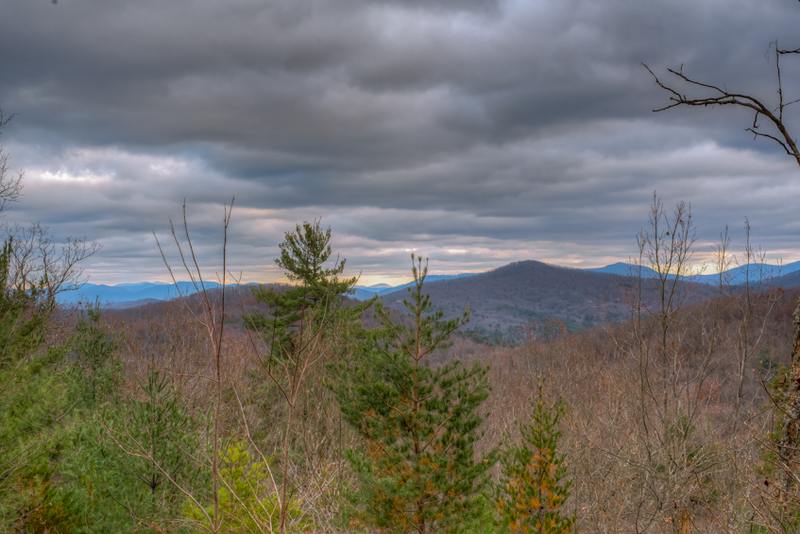 01/16- The scenery was beautiful and it was not too far away from Atlanta. There were plenty of plates and glasses and the kitchen table was nice and large for a big group. The hot tub was also big. There are two look outs from each master room. 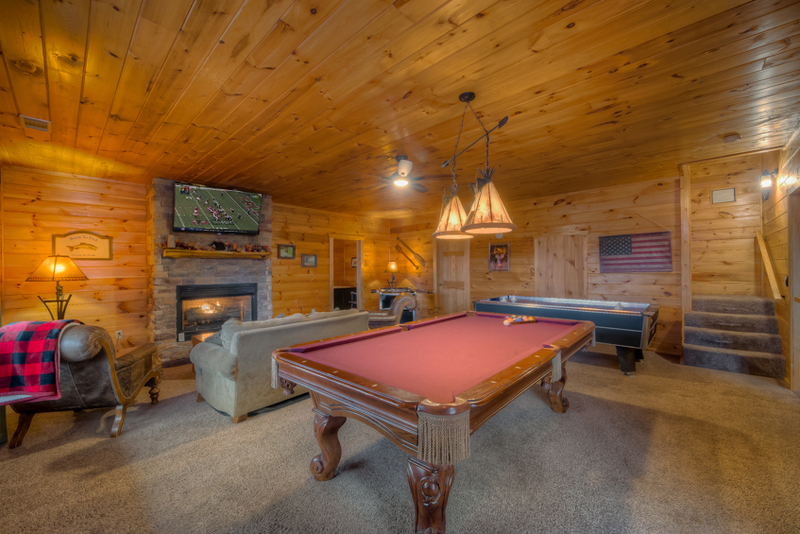 Three nice game tables (pool, ice hockey and foozball)/ We like renting from you because it is seamless and you give great directions to the cabin and warn us ahead of time of hills and issues. The cute welcome pack and cleanup instructions are also great. Love the website as well, easy to see which cabins are available. Probably love that the most!! Good job! 10/15- The cabin was warm cozy and immaculate. It was all I expected it to be. The staff is extremely knowledgeable, courteous, patient and helpful. It is because of the staff that I would definitely use escape to blue ridge for our next visit. I will now have to make sure that on future visits the cabin has a paved driveway. 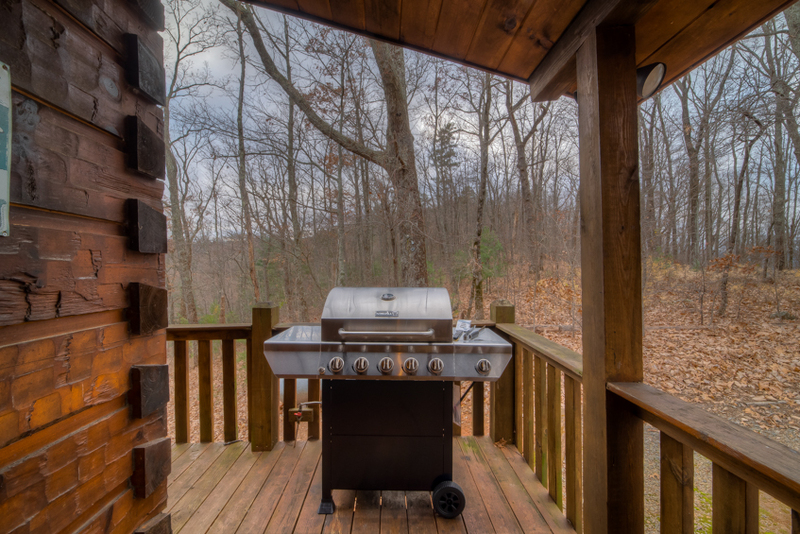 10/15- The wrap around porch and gas logs were nice, as was the view. Accessibility to nature trails was also convenient. 10/15- Play room and bedrooms were very nice. Kitchen is small but we made do. Driveway is not good! 09/15- The fire pit was the most awesome attribute of this mountain home. Bathrooms were very clean and the towels & bed linens were quite nice. We enjoyed the mountain view from the upper deck. 06/15- This cabin was WONDERFUL for hiking - trails right out your door! The cave was so much fun and also the hike to the waterfall. The layout of the cabin was great for the six of us plus our two 7 month old grand babies. The game room was terrific. The cabin was very spacious, and we had a fantastic time! WE THINK YOU ARE AWESOME!! We have recommended you to so many friends and family. We have rented four times from you, and we will be back! Everyone is so accommodating. You go out of your way to answer questions about the cabins. It is so easy - the rental process as well as getting the "keys", etc. you are TERRIFIC!! There is a certain standard that we feel we can depend on. THANK YOU! 04/15- The remote location and views were great. The hiking trail adjacent to the cabin was a nice surprise. 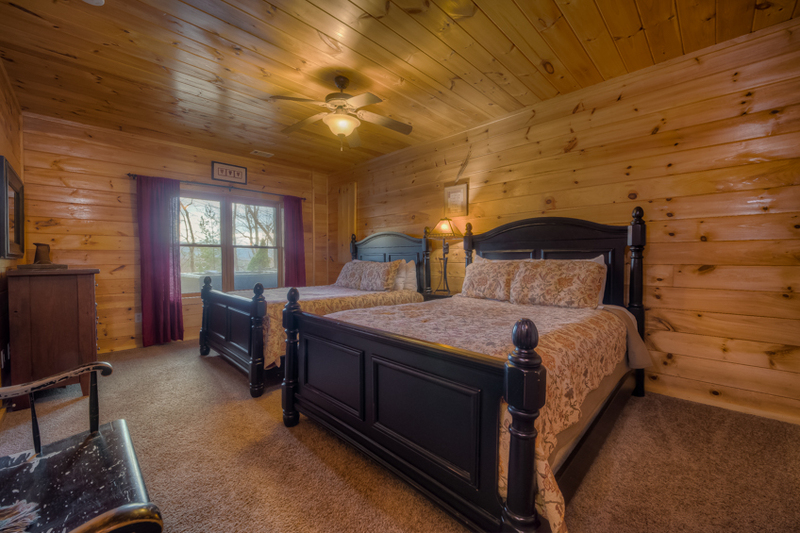 Cabin is very large and roomy with big rooms and the 2 master rooms open onto the porch. Big fire pit. 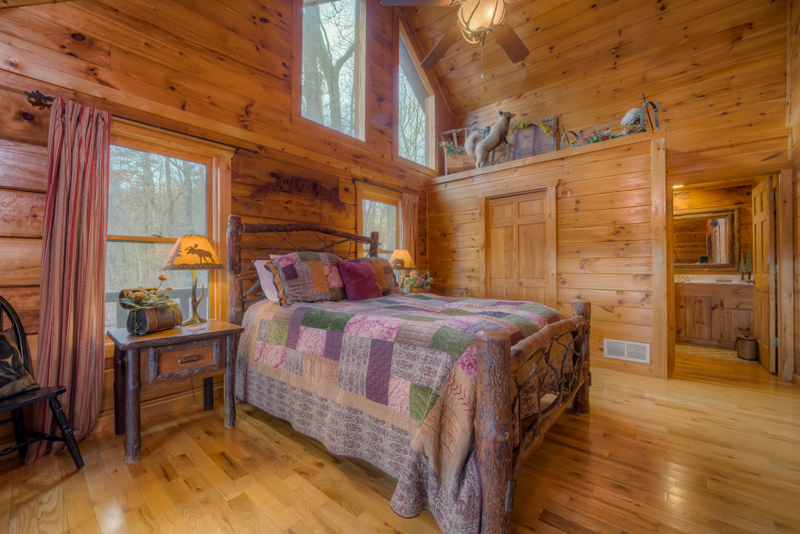 Nicely decorated cabin. 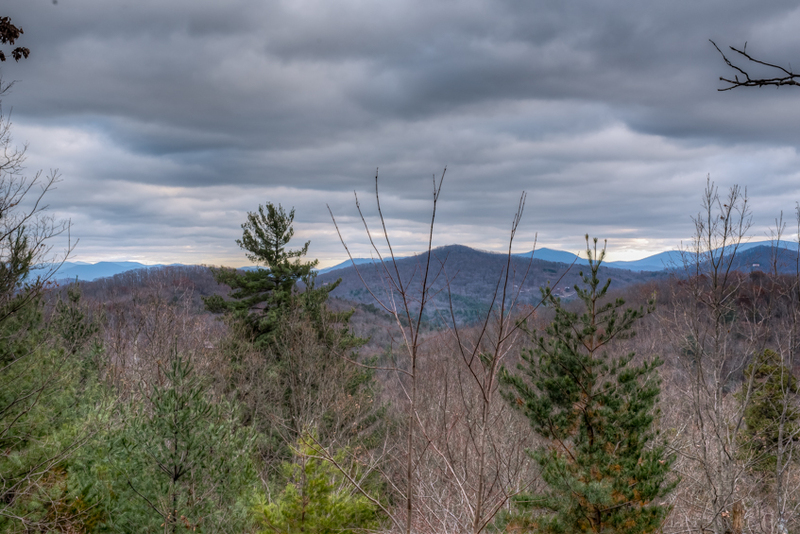 Close to the town of blue ridge and merciers orchards. Deer on mountain. 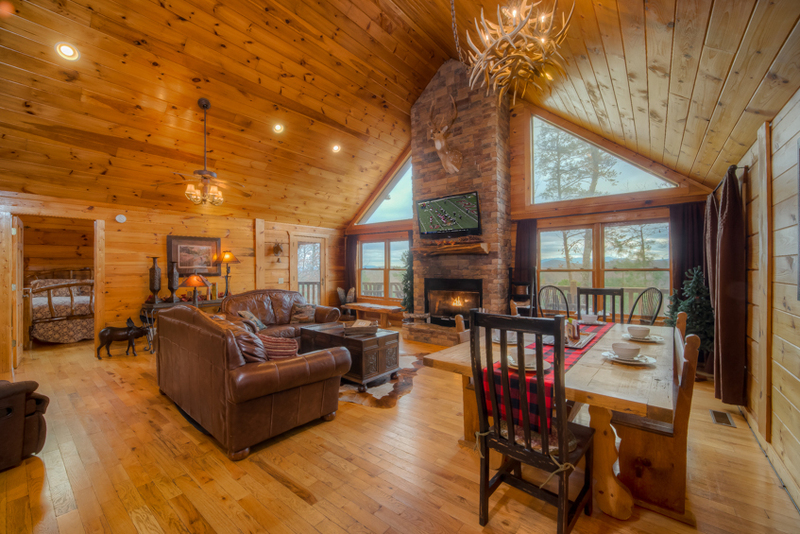 Great cabin for families with kids. 02/15- perfect downstairs for kids, timers on gas log fireplace are nice features. 12/14- My family enjoyed all the entertainment that is downstairs. The view is beautiful and we enjoyed our walk to the cave. 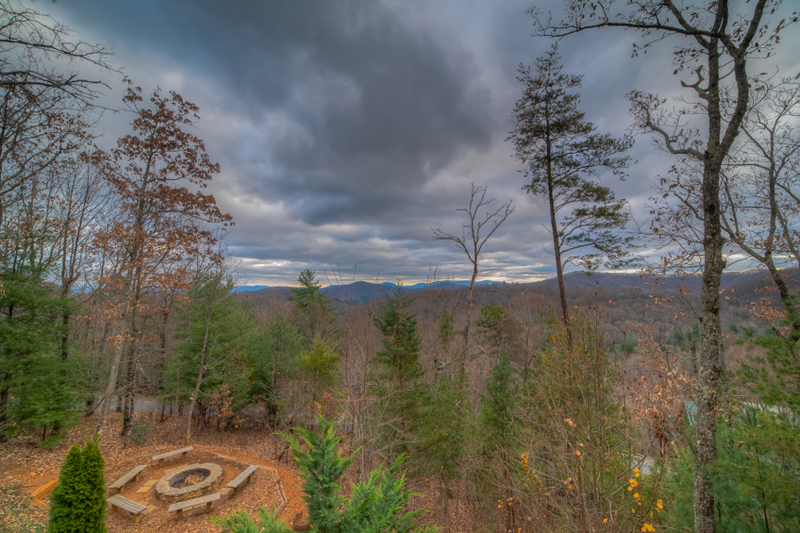 11/14- The view and the close proximity to the walking trails were the favorite features. 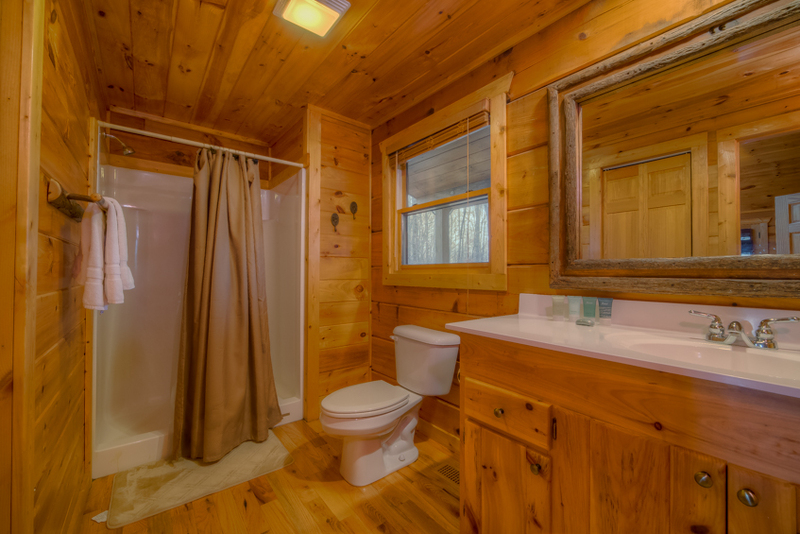 10/14- Loved the bedroom and bathroom spaces. 7/24/14 My family were very happy with the cabin. It had EVERTHING!!! We felt like we were home! Everything was extremely clean, which was heaven for me because maintaining cleanliness was a breeze for me. All the comforts of home. Loved it! One suggestion: Paving the driveway would be really nice! 07/14- The view is absolutely beautiful! 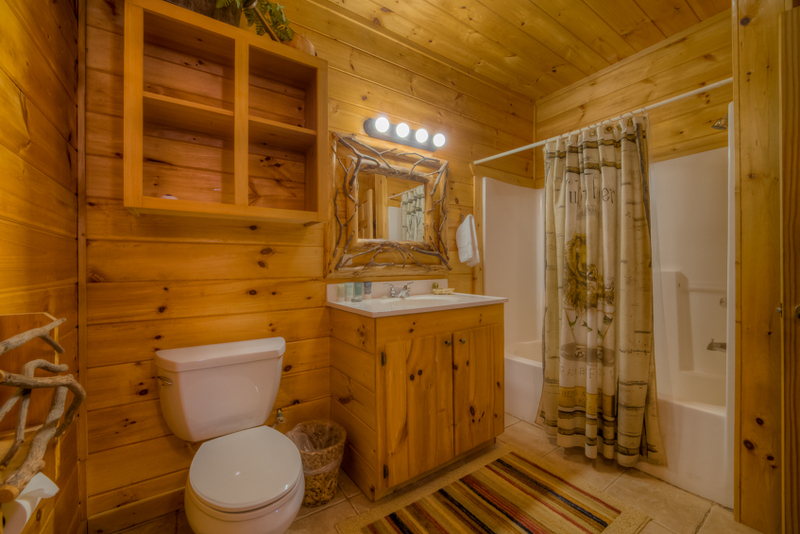 The cabin is well furnished and came with plenty of linens. We enjoyed the different games downstairs and was so glad there were enough beds for everyone! Heaven on Earth was a great cabin for a weekend of golf and white water rafting. The cabin was spacious had great views. The fire pit is great for an after dinner fire. 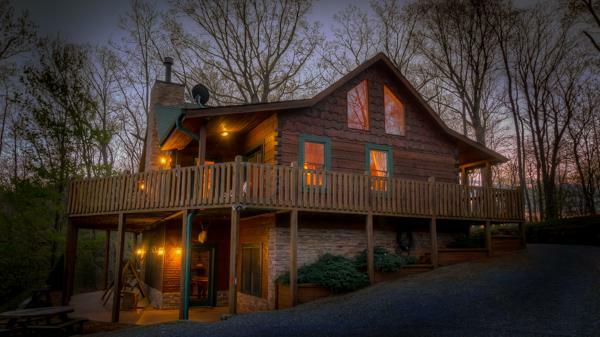 Highly recommend this cabin and we look forward to returning. Escape to Blue Ridge was very friendly and helpful. All the instructions for code access and directions were sent in a timely manner. 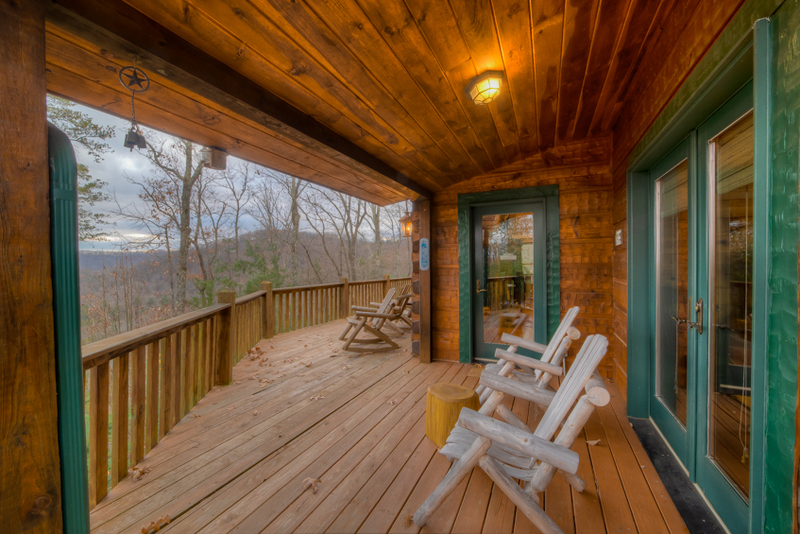 We highly recommend Escape to Blue Ridge.